Federal Communications Commission chairman Tom Wheeler's proposal to inhibit joint sales agreements between TV stations is already shaping up to be a fight that will split along party lines. With Commissioner Mike O'Rielly's statement released Monday—which supports keeping JSAs as an option for small-market broadcasters—both Republican commissioners have publicly expressed their opposition to Wheeler's proposed change, which will be on the agency's agenda at the end of the month. Wheeler has called joint sales agreements, where one TV stations sells advertising time for another, a loophole in the ownership rules that allow big broadcasters to essentially own a second station without having that count as ownership. 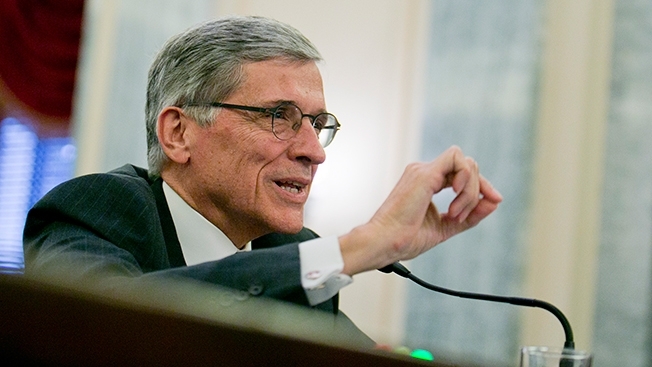 Although the FCC has allowed the deals for more than a decade, Wheeler says, "it's the right thing to do" to address that loophole now at the commission's next meeting at the end of the month. Siding with broadcasters that argue the deals help minority and niche stations survive in an increasingly competitive market, O'Rielly said Wheeler's proposal "appears flawed and not in the public interest." "My meetings and the record indicate that the JSA portion could significantly impair the ability of broadcasters with diverse voices to offer local programming, such as news, to meet consumer needs," O'Rielly said. "Even before receiving the specifics of the proposal, I strenuously disagree with the intended direction." O'Rielly's premise—that minority stations would be the ones to suffer—got support from Juan Williams, Fox news analyst and a columnist for The Hill. In a Wall Street Journal column, Williams pointed to the example of Armstrong Williams, the only individual black owner of a TV station (he has two), who has an arrangement with Sinclair Broadcast Group. "The black-owned stations simply lack the economic scale to get adequate advertising rates to pay their bills or even buy the station," Williams wrote. "For example, the bank that lent Mr. Williams $50 million to buy his stations did so with the understanding that he had the agreement with Sinclair, the much bigger firm." As Williams also pointed out, even the National Association of Black Owned Broadcasters, a group that once opposed JSAs, now supports them. It's no secret that Democrats and liberals in Washington dislike Sinclair's more conservative politics. Sinclair operates middle and small size stations but it recently inked a deal with Allbritton Communications to buy its broadcast group, which includes WJLA, the ABC affiliate in Washington, D.C. That may be a little too close for comfort. The company has about 20 JSAs or shared service agreements and proposed adding three more as part of the Allbritton deal, still pending at the FCC. "My suspicion is that liberals at the FCC who claim to be interested in promoting diverse broadcast ownership lose interest if the owner is a conservative like Armstrong Williams. They want diversity, but not of the political kind," Williams wrote. Last month, FCC commissioner Ajit Pai warned that taking on JSAs would be a "fatal mistake." It just wouldn't look good, Pai argued, to anger broadcasters at the very time the FCC is looking for TV stations to voluntarily give up spectrum for auction to wireless companies. More recently, Pai reiterated that position. "I hope that we will look past the rhetoric and base our decision on the facts … The record before the commission clearly establishes that JSAs like this one [WLOO TV, an outlet in a historically African-American college town in Jackson, Miss., that is operated by American Spirit Media/Raycom Media, which owns WDBD in town] facilitate new entry into the broadcast industry, enhance ownership diversity, and allow stations to serve the local community better," Pai wrote in a blog post. Wheeler did leave the JSA door open a crack in his proposal, suggesting the FCC could provide waivers to the new rule on a case by case basis, an approach O'Rielly wrote off as "a very subjective 'mother-may-I'" approach that is a "recipe for market uncertainty and reduced offerings." In a peremptory move, the House commerce committee has inserted language into a reauthorization of a satellite bill that would prevent the FCC from making any move on JSAs until it completes its statutory duty to review all of its media ownership rules. If passed, it might not stop the JSA rule change, but it could slow it down.